Jemmy's Return, Sayer, 1787, Yale University Lewis Walpole Library. 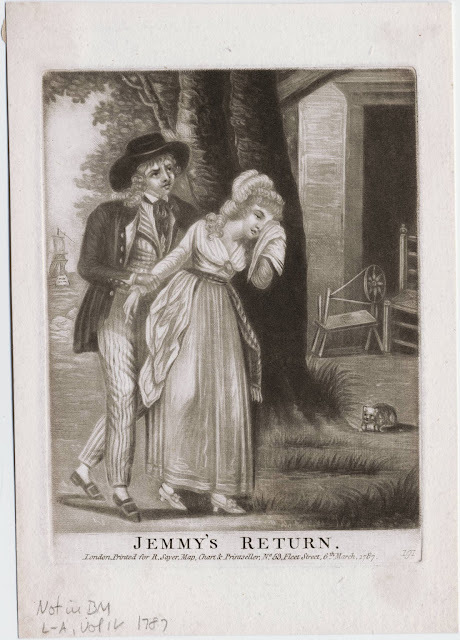 One of the more dramatic examples of the "sailor's return" trope, Jemmy takes his love by the wrist as she weeps with happiness into her dress. In the distance to the left we can see a ship sailing away. To the right is a spinning wheel and ladder back chair, and a very poorly drawn cat. Jemmy wears a round hat with a wide brim, out of which flows long strands of curly hair (far longer than most sailors). His black neckcloth is neatly tucked under a white collar, and from beneath the neckcloth we can see ruffles of a shirt that is much fancier than most sailors would ever have worn. The jacket is lined in white and fitted with metal buttons on both the lapel and the slash cuffs. The lining does not extend all the way down to the tail of the jacket, suggesting that lining was only sewn in where it was most needed. The waistcoat and trousers are both of a vertical striped fabric. There had been some debate over whether or not sailors painted stripes onto their clothing, but we see here that the waistcoat is without lining, and bears the stripes both on the interior and exterior of the garment. This would suggest that the fabric itself was striped, and that these were not decorations added by sailors after the fact. As is usual for his profession, Jemmy wears white stockings, pointed toe shoes, and rectangular buckles.